I’ve got a post on BetterBikeShare.org today about an issue that needs more attention in the bicycle world: the difference between wealth and income. Low income means you have little money coming in. Low wealth means you have little money at a given time. These are different things, neither pleasant – but of the two, it’s wealth that functions as the crucial barrier to using a bicycle. And that matters a lot to the way that bicycling advocates should think about racial inequality. Two years ago, a post on our site asked “Why don’t more African-Americans ride bicycles?” The issue isn’t that Black Americans don’t bike — they’re almost exactly as likely to get on a bicycle as white Americans, for example. 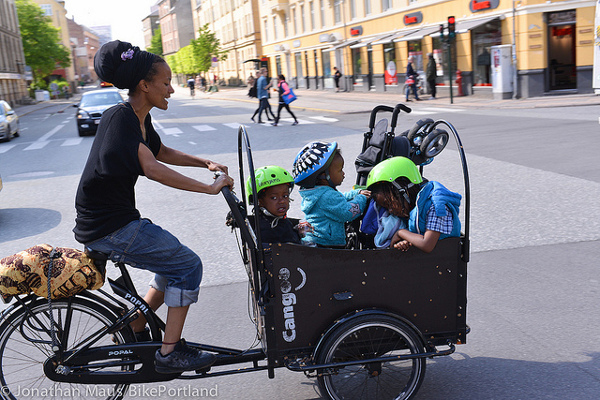 Instead, the question was why, given the much lower rate of car ownership by Black families (about 20 percent of Black-led households don’t own a car, more than double the national average) bicycles weren’t doing more to fill those mobility gaps. This question matters to long-term racial equity because the single most powerful predictor of multigenerational poverty in the United States seems to be how hard it is to move around one’s city. Could bicycles promise people more time with their kids, or access to more or better job options, or more contact with far-flung friends and family — but then fail to deliver those promises because some aspect of racial inequality prevents or deters people from bicycling? That’s what we and many other people want to know. There’s no single answer. But in today’s Better Bike Share post, I shared some statistics that matter. According to analysis of 2011 Census data by the Center for Global Policy Solutions, the median Black-led household has $25 in liquid wealth on hand at any given time, not counting retirement savings. The median Latino household has $100, and the median white household $3,000. Source: 2011 Census data analyzed by Center for Global Policy Solutions. Bicycle price: BicycleBlueBook.com. U-lock price: Amazon. Tuneup price: Trace Bikes and Bike Gallery. Obviously there are millions of white, Asian-American and other households with equally tiny amounts in the bank. But it’s half of Black households that have $25 or less to spare for a one-time expense like a decent bicycle — let alone one with a secure lock, good lights or good maintenance. That’s a massive share of the U.S. population, especially the Black population, for whom buying a transportation-quality bicycle is virtually off the table. And if a lot of your friends and family are also Black, there’s even less wealth to draw on for something useful. …but it isn’t nearly as deep as wealth inequality, which has accumulated over generations of systemic racism in housing and other areas. This is actually part of the great potential of bicycling. Compared to cars, bicycles don’t require much money all at once. It only takes a fairly small amount of cash, or a fairly small drop in price, to help a cash-poor family start getting the benefits of bike access. Earn-a-bicycle programs at nonprofit bike shops and other outfits around the country are great ways to take advantage of this. So is getting the price of a simple but durable bike lower — maybe by improving the quality of the inventory at big low-cost retailers like Walmart. For many other reasons, which my colleague Stefani Cox will continue to explore on BetterBikeShare.org, bike sharing is still far underused in the United States by poor people and people of color. But if it can be made useful and attractive, bike sharing can be a powerful tool for lowering this huge barrier that many Americans face to putting bicycles to work in their lives. > Why don't more African-Americans ride bicycles?